So after a little delay we are proud to announce we will be providing the event bike cleaning service for the inaugural SummerFest 2017. Summerfest 2017 is a brand new event taking place in Leyton Jubilee Park on 24th June. The event is run by Waltham Forest Council and combines the sport and craft beer! What could be better?! 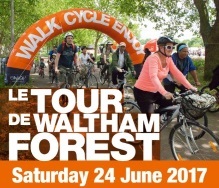 Naturally we are very excited to the event bike cleaning service for SummerFest 2017 and the Tour De Waltham Forest. This is an annual cycling event where local residents discover their borough on two wheels. Four separate rides are available from Bronze right through to Platinum, for the family friendly to the more serious 27 mile route. We will be stationed not far from the Start / Finish line so bring your bike down to us for a good clean. It will be completely FREE and the machine only takes a matter of seconds to wash it, it'll be dried and maybe polished and lubed too! Our only suggestion is to make sure to get there before we are attracted to the craft beer tents! Looking forward to seeing you all there and posting a review of the day in due course! Want to hire us for a similar event? Contact Us here and read about how we support cycling events here.